This article is about the biblical figure. For other uses, see Samson (disambiguation). Not to be confused with Sampson, Sanson, or Samsun. Samson (/ˈsæmsən/; שִׁמְשׁוֹן‬, Shimshon‎, "man of the sun") was the last of the judges of the ancient Israelites mentioned in the Book of Judges in the Hebrew Bible (chapters 13 to 16) and one of the last of the leaders who "judged" Israel before the institution of the monarchy. 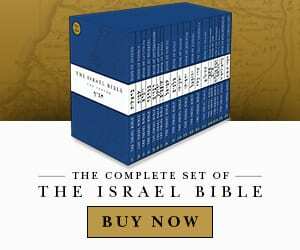 He is sometimes considered to be an Israelite version of the popular Near Eastern folk hero also embodied by the Sumerian Enkidu and the Greek Heracles. 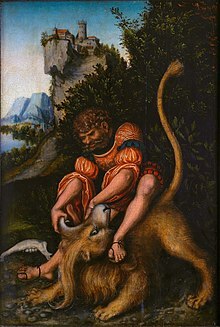 The biblical account states that Samson was a Nazirite, and that he was given immense strength to aid him against his enemies and allow him to perform superhuman feats, including slaying a lion with his bare hands and massacring an entire army of Philistines using only the jawbone of a donkey. However, if Samson's long hair was cut, then his Nazirite vow would be violated and he would lose his strength. Samson was betrayed by his lover Delilah, who ordered a servant to cut his hair while he was sleeping and turned him over to his Philistine enemies, who gouged out his eyes and forced him to grind grain in a mill at Gaza. When the Philistines took Samson into their temple of Dagon, Samson asked to rest against one of the support pillars; after being granted permission, he prayed to God and miraculously recovered his strength, allowing him to grasp hold of the columns and tear them down, killing himself and all the Philistines with him. In some Jewish traditions, Samson is believed to have been buried in Tel Tzora in Israel overlooking the Sorek valley. Samson has been the subject of both rabbinic and Christian commentary, with some Christians viewing him as a type of Jesus, based on similarities between their lives. Notable depictions of Samson include John Milton's closet drama Samson Agonistes and Cecil B. DeMille's 1949 Hollywood film Samson and Delilah. Samson also plays a major role in Western art and traditions.